Set of vibrant colored paint with gloss shimmery finish. 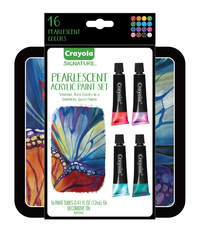 Crayola Signature Pearlescent Acrylic Paints offer vibrant colors that give off a shimmery gloss finish. These paints contain a multi-dimensional pigment that provides superior coverage.